You were supposed to get a well-researched post on Redfern Ltd. this week, but I've read several posts on Outlander lately and I want to add my two cents. To be perfectly honest, my initial impression was (and is, for each new outfit), "hmm, I see where they were going; I wonder if they know about [construction thing]? [Aspect] makes it very costumey." Overall I would like to see more winged cuffs and caps, but I'm very happy with the materials used, Annette Badland's tying-over-the-kerchief brown gown, and Claire's 1940s wardrobe. One thing that is really bothering me, though, in this dialogue - and how wonderful is it that in this day and age, film designers, fans, and recreationists can now communicate with each other directly? - is the idea that discussing issues of dubious accuracy is insulting the designer or saying that the costumes are terrible because they're inaccurate. I can appreciate the handwork put into the wedding robe de cour, even while I believe that a robe à la française would have been a better choice of dress. I feel very comfortable asserting that we all understand that television is not the same as a reenactment, that the number of garments that have to be turned out in a short time means machine-friendly methods have to be used, and that the people who get the final say on costuming decisions are mostly not people with any experience on the subject. Right? It's common sense, and I think we're all on the same page. As I've previously discussed regarding The Great Gatsby and Pride & Prejudice, and as Lauren discussed regarding Outlander, there's a lot of room to talk about costumes that aren't 100% accurate in terms of their inspiration, what they're saying about the characters, and why the changes from the accurate were made. But you can be interested in all of these things and accept the prior paragraph, and still want to talk about what wasn't quite right. For one thing, it can be fun to test yourself on how much you know, what you pick up on - sometimes you notice things that you didn't realize you knew, just by analyzing what it is that's bothering you about an outfit. (This is how I tell if a museum garment is an antique reproduction or has been messed with. What's off? Why do I have a weird feeling? Ah, there's something wrong about the closure/the fabric/the trim.) For another, it's a way to vent and get over the annoyance. Claire likes a drink. And laced-on sleeves. But see, here's the rub: Rowenna makes a good point - it's not right to imply that the clothing that makes it on the screen is entirely the result of research if you know there are other factors involved and you know it's not totally accurate. 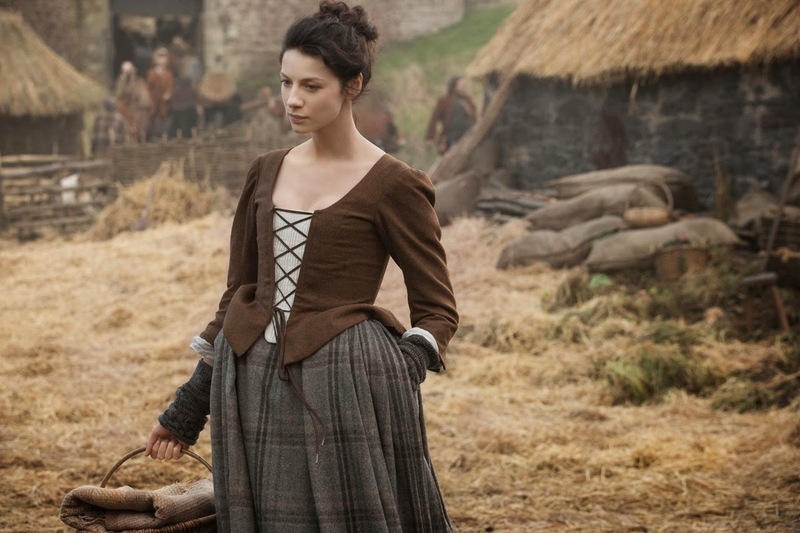 The discussion around Outlander has been influenced to an extent by a now-deleted post on the designer's blog (viewable through the Wayback Machine) which contained various incorrect statements - that women only bathed once a year, that it takes 20 minutes to lace up stays, the dreaded bodice - presented as fact. It's natural and understandable for people who study history to be annoyed when a professional presents myths as facts to an audience willing to believe them. When questioned, Ms. Dresbach started out dismissing the critics and eventually fell back on "I have 25 years of experience, I know what I'm doing." Sidebar: I wasn't involved in this, but I've had the "decades of experience" card played on me in online discussions - and I just want to put out a plea to everyone everywhere to avoid this defense even when it seems totally appropriate to the situation. Either your data stands up to scrutiny because you have a good citation for it, or it does not. I could have spent five years researching 18th century French dress in detail, and still have a newcomer stumble across a primary source reference to something rarely mentioned that turns some of my statements upside down. Someone else could present a belief about Regency dress based on years of looking at fashion plates that my patterning would overturn. I'm concerned about the way this has been represented in the comments to Lauren's post - this isn't a case of reenactors being too picky about what appears on the screen and being hostile to a costumer because of it. The issue runs deeper than that, and it has to do in part with a widespread perception that reenactors/historians are unable to deal with anything less than 100% accuracy without being mean - which means that of course someone who self-defines that way will have a shallow opinion of film costuming ("it's not totally right, so I hate it") and has no business getting involved in a discussion about it. Of course it's not practical for a costume designer to badmouth the higher-ups who nixed accuracy for a particular costume in order to make it cost less, pick up the light better on camera, stand out more, or look sexier. And I'd never say that professionals should kowtow to their audience and apologize for everything wrong in advance. But can't we have a middle road? Let's treat each other as equals. Because costume designers are usually so far from us, it's been easy to imagine all kinds of motivations for them and put inaccuracies down to ignorance. So let's stop assuming that and try a little harder to see the positives and possibilities. I admit that I wasn't very good about it myself until I started reading Tom & Lorenzo's Mad Style posts, and then started applying the same type of analysis to Downton Abbey. On the other hand, it's important for costume designers to understand that we don't go looking for mistakes: we just see them. If you spend enough time studying the construction of a type of gown, it can be like nails on a chalkboard to see (for example) the modern armscyes and pieced backs that are a constant presence in 18th century costuming. It's not that we seriously expect the same level of accuracy that we bring to bear on ourselves - it's just an unavoidable side effect of this field. It's also important to remember that while the majority of us don't do this on a paid, professional basis, that doesn't mean we aren't knowledgeable: it means that we're so devoted to the subject of history that we do it despite the lack of payment. The costumes in Outlander are demonstrably not 100% accurate, even if we use a movie definition of "accurate" and not a progressive's. (Geillis's are especially odd.) Let's not gloss over the steps between the research and what appeared on the screen - there is a sizable group of people here who would love to talk about what had to be left out and why. Why do Claire's jackets have princess seams and (in one case) laced-on sleeves? Are any costumes repurposed and dressed up/down? Why do the petticoats have so many pleats? I don't understand. I don't understand the giant eye brooch either. I'd wondered about the knitwear, and Ms. Dresbach's explanation for it is illuminating. I hope that in the future, more costumers will talk directly to us about topics that might be considered too esoteric or boring for a mainstream interview, instead of actively discouraging our participation on an involved basis. PS: There is a reference to a spoiler in the comments. I put SPOILER markings around it, but please be warned. Thank you, Cassidy, for such a positive post! It can be hard to sometimes to not criticize. Even a shopping spree can turn into "why did they use this hem technique? why did they use this color/trim/etc.?" It's like we are hard-wired to spot out incongruencies! Thanks! It can be hard, and I'm pretty pro-complaining in general, really. Humans probably are hardwired to spot incongruities! Thank you kindly! It is tricky, and I hope it doesn't rebound badly in some way, but it would be unbelievably great if this sort of thing became more common. There definitely are a lot of times that I'd like to ask crazy nitpicky questions. No spoilers, but if you read the books, there is a reason why Geillis's costumes are odd. I think everyone has a valid point here, but a costumer is also telling a story with clothing. We may not know what those reasons until later. Then we have an 'aha' and it all makes sense. In that case the costumer is better researched. I find that I can separate the viewer from the costumer. If the costume is making me feel what I'm meant to feel, it is successful. It's the reason I don't join book groups. I like to read the story, I don't want to analyze it. As a theater major, I had a very hard time enjoying going to the theater because I couldn't alloy myself to let go and let the show flow over me. I noticed every shaky set wall. But there is something in the theater called 'willing suspension of disbelief' I love a well reasoned debate, but the problem as I see it, is that Terry Dresbach has done something that will be a boon to costumers for a really long time. She has posted close-ups, details, sketches and reasons for decisions. In ten years, if a costumer wants to reproduce something from the show they will have the original source. I think that we need to be grateful. She didn't have the benefit of the expertise that this community has to share when she did the first season. If we are respectful and appreciative, then she may come to us in future for help and information. Haha, yes, I do know the Thing about Geillis! I have speculated that her costuming is related to that, but it seems a bit OTT to me; I'd be interested to know if show-only fans *are* picking up that she's different based on her clothing. I had an idea that SPOILER she could have been dressed ordinarily but with a constant late '60s-early '70s color scheme, lots of gold and brown and avocado, and maybe had a few other design influences from that era END SPOILER but that might be going into Mad Men's "the roses on Joan's dresses show the state of her marriage" kind of subtle territory. Respectful, IMO, doesn't mean that we sit in silence and applaud. What I'm advocating for is respectful - respectful is not assuming accuracy issues were made out of ignorance, not making personal attacks ... In the comments to the deleted post, I do think the reenactors and historians eventually stepped over the line, but Ms. Dresbach did as well (and given some of her responses, I don't think she wants outside help or research). Respect is a two-way street, and in the end I believe respect is treating someone as we treat our own: not jumping out of the bushes going "You!! WRONG!!! ", but having a reasoned discussion and looking for clarification. I'm not really interested in movie-based historical costuming, so the personal gratitude just isn't here for me - but to put it in my own perspective, I'm very very grateful to the Metropolitan Museum of Art for putting so much of their collection online, but that doesn't mean I'm never going to say that a gown isn't misdated when I believe it is, or isn't dressed or photographed badly. At the same time, as I wrote about in my corset posts, people soak up information from fiction. 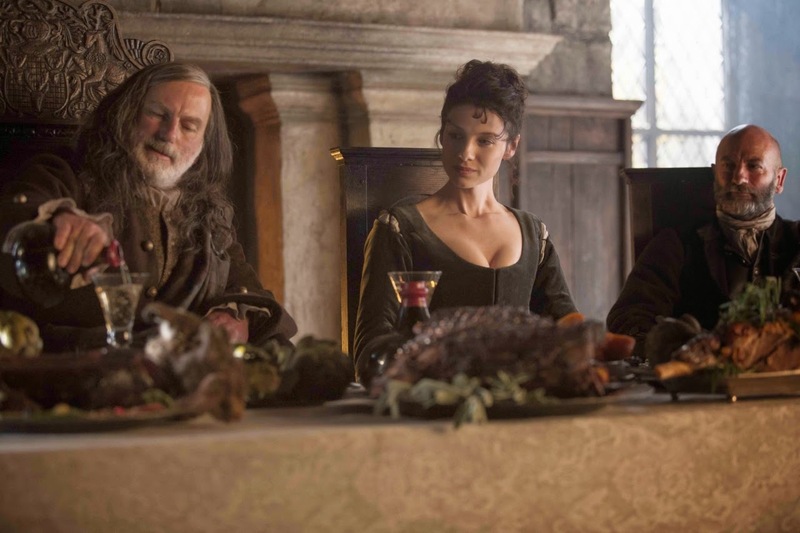 For the most part Outlander isn't reinforcing common stereotypes (I did praise the show earlier for not making a big deal out of the stays), but in general this is a solid reason for talking about missteps in period costuming onscreen, even while talking about what the costuming is doing within the story. There are stays (not bodices) with lace-on sleeves from the first half of the 18th Century, so I can see where those comes from. Only all paintings of women wearing them and all the extant ones are either from Italy or south of France, so it seems to have been a quite regional fashion from areas that can be quite hot. To be a costumer give you an opportunity to say something about a character with their clothes, so I read Geilis somewhat odd clothes as a pointer to her odd personality and though it is probably more about making Claire pretty, I choose to see her lack of caps as a pointer to her Outlander status. Yes, I wondered if the laced-on sleeves were drawn from those stays - but like you point out, that's another context issue like the robe de cour. I do think those are probably the reasons for those specific decisions, at least in part. Great post. I certainly agree that while we should be respectful that doesn't mean we need to stay silent. One little point on the princess seams - Two Nerdy History Girls posted on an extant 1785 highland wedding dress. In their post they have a link to a pdf on the dress with seamlines and details. The dress has something very similar to princess seams. Whether this was a modern or later period alteration I don't know but I can easily imagine that the designer has seen this dress and based some costumes off of it and used that as her justification for princess seams. That's so interesting! I can't see it in the photograph itself, and the plaid is matched there - looking at the photo and the PDF together, I wonder if it's actually a straight, piecing seam rather than anything structural? I wish the PDF were better written, I'm more confused about a few aspects of it now than I was before! The PDF construction details describe an "underbodice" by which the gown is laced shut under the closed front, which is then pinned. Could the seam sketched in the drawing be the point at which this "underbodice" is attached, rather than a structural, pieced, or shaping seam in the gown bodice itself? Comparing with gowns (such as those in the Patterns of Fashion book) that have similar construction, this seems to match up. First: The giant eye looks like it may be intended to be a miniature portrait to me--those were a weird trend in the late 18th century: http://www.winterthur.org/lookoflove (I love weird trends...) But I haven't seen a close-up to know for sure (maybe you have and can dismiss my cockamamie guess?) and of course, to have a miniature portrait of an eye implies that there's a specific relationship there and all other kinds of nuance. Perhaps that's what is sometimes missing in translating the aesthetic of the past to modern reproduction--so many items have particular nuances or meanings or "rules" surrounding them, and mixing and matching can yield unintended results. I do think the eye is meant to be a miniature - in design, it's reasonably accurate, marquise-shaped and edged with pearls - but it's huge. Late 18th and early 19th century eye portraits were much smaller. Agreed. Unless someone's lover had an insanely large eye and they just had to represent that somehow...lol! And an actual response to the whole of your post--Brilliant. I agree completely that we can be respectful but still engage in dialogue. I think there is nothing wrong with accepting different priorities and motivations in historical clothing re-creation, and then delving into respectful conversation from there. Will I always prioritize accuracy for myself? Yes. Will I enter conversations knowing that not everyone has the same priority as I do? Most definitely. To not do so makes a value judgment about other priorities--and that's not my place. I agree with Lauren that it was incredible to have the opportunity to actually have a conversation. I was particularly grateful for the respect and, for the most part, lack of defensiveness. It looks from the deleted blog post that Terry had really gotten it handed to her for sharing some incorrect "facts." There's no reason to be rude with someone, even if they are objectively, factually incorrect--and I've left "progressive" forums over that. (Sienote: Progressive? How is rudeness progressive? Sidenote over.) Engaging in dialogue helps all of us--so does honesty. "Yes, I know this is a stretch historically, but I defend this choice because" is much more helpful than insisting that one is completely correct (I'm speaking generally now, not pointing fingers at any one person. I see reenactors do this allthetime). So is "Yeah, I did that, and then did more research, and well, I was wrong." Admitting when we're wrong--heavens! What a boon THAT would be to one another's research! And on that, I don't envy costume designers whose work is immortalized in film one bit. I've reworked so many of my own pieces based on better or emerging research--to have to look at them walking around, uncorrected, on TV would make me crazy (it's bad enough on Facebook)! Thank you! I totally agree, on both paragraphs. My qualifying paper isn't too bad, but in working on my pattern book I've found a few things that weren't quite right about it, which is very frustrating, but at least the paper is only in the special collections at FIT and nobody will see it. It's hard to admit to being wrong, especially if it's after the fact and there's nothing you can do about it: I'm definitely a lot better about it when my wrongness is in the past and I'm writing a new post (or book) about the new information.